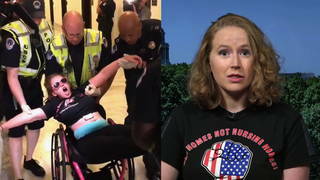 In “Dangerous” Move, Republicans Push to Strip Healthcare from Millions Without Holding Any Hearings | Democracy Now! senior national correspondent for Bloomberg Businessweek. His new book is titled Devil’s Bargain: Steve Bannon, Donald Trump, and the Storming of the Presidency. "Devil's Bargain: Steve Bannon, Donald Trump, and the Storming of the Presidency." AMY GOODMAN: Tuesday was another dramatic day in Washington. On Capitol Hill, Senate Republicans voted, by the narrowest of margins, to open debate on repealing Obamacare. Vice President Mike Pence broke a 50-50 tie in the Senate. Two Republican senators, both women—Susan Collins of Maine and Lisa Murkowski of Alaska—joined Democrats in voting against the motion to proceed. Republican Senator John McCain made a dramatic entrance and cast a decisive vote to open debate, after flying in from Arizona, where he’s being treated for brain cancer. But hours later, the effort to repeal or replace Obamacare faced another setback when nine Republicans joined Democrats in rejecting the first healthcare proposal. Meanwhile, President Trump continued to publicly humiliate his own attorney general, Jeff Sessions, who was the first senator to endorse Trump during the 2016 race. On Twitter, Trump has described Sessions as “beleaguered” and “very weak.” Then, at a news conference in the Rose Garden, Trump told reporters Sessions shouldn’t have recused himself from the probe into alleged Russian meddling in the 2016 election. PRESIDENT DONALD TRUMP: I am disappointed in the attorney general. He should not have recused himself, almost immediately after he took office. And if he was going to recuse himself, he should have told me prior to taking office, and I would have, quite simply, picked somebody else. So I think that’s a bad thing, not for the president, but for the presidency. I think it’s unfair to the presidency. And that’s the way I feel. Thank you. AMY GOODMAN: To talk more about these latest developments, we’re joined by Joshua Green, senior national correspondent for Bloomberg Businessweek, author of the new book, which we’re going to spend the hour talking about today, Devil’s Bargain: Steve Bannon, Donald Trump, and the Storming of the Presidency. Welcome to Democracy Now!, Josh. JOSHUA GREEN: Great to be here. Thanks. AMY GOODMAN: It’s great to have you with us. So, a lot happened yesterday on a number of fronts. Yes, President Trump continued his attack on his attorney general, Jeff Sessions. And, in the narrowest of votes, the Senate voted to move ahead in repealing and, I don’t know, possibly replacing Obamacare, right? Fifty to 50, two senators, both women, joining the—two Republican senators joining the Democrats voting against opening debate, but, ultimately, Vice President Pence broke the tie, and they are moving forward today. The significance of all of this? JOSHUA GREEN: Well, it’s significant that they moved forward—in Congress, it’s called a motion to proceed, and this is just to begin the debate. This is what happened yesterday, and there was real fear in the White House and among Republicans that they wouldn’t even get that far, that sort of this is the stage that healthcare might die on. But, as we saw, McCain came back. He provided the 50th vote. Pence was the tie-breaking vote. Then they could move forward. But I think the real signal yesterday about how things are going came when they voted on this deeply unpopular Republican Senate bill and had nine defections. That’s a very bad sign for Republicans who support repeal and some kind of replacement. It doesn’t get any easier going forward. And so, there is going to be debate. There’s going to be what’s called a vote-a-rama, where different amendments are voted on. But the kind of last-gasp hope for Republicans is they might be able to pass a scaled-back version of repeal, known as a skinny bill, that only takes away some of these benefits, but less than what they’d like to take away. AMY GOODMAN: Many commenting online, on social media, here was John McCain coming back, very moving as he hugged Democrat and Republican colleagues, but then, ultimately, voting to open the debate—not that he said he would necessarily support what was going to be presented next, but coming back from his own surgery, what most people in America could not have afforded if they didn’t have healthcare. JOSHUA GREEN: Yeah, there’s something striking about this, because I was in Washington reporting on healthcare back during the Obamacare fight, when Ted Kennedy, who had the same brain cancer that John McCain has now, flew back in, clearly weakened, to cast the deciding vote to give people healthcare. And here McCain is, and he comes in and gives this dramatic speech about how Republicans need to return to regular order, which they’ve ignored throughout this process, and casts the deciding vote to go ahead and take healthcare away from people. It was a dramatic bookend. And I think it just shows how extreme even Republicans like John McCain, who has always been considered kind of a populist maverick, someone who flirted with switching parties and becoming a Democrat, 10, 15 years ago—how far out on the rightward fringe they’ve gotten. AMY GOODMAN: —that it’s two women senators, Republican, who joined with the Democrats. JOSHUA GREEN: I think that’s right, because there are all sorts of things in the bill. I mean, I know Susan Collins of Maine, one of the women senators, had said, you know, she objects to the fact that the bill would defund Planned Parenthood, and that was a deal killer for her. There aren’t any men among the Republican Senate caucus that feel the same way. So it’s so important, the individual politics of the senators. But you can also see the importance of individual Senate races. Had Democrats won an additional seat last year, this motion to proceed on healthcare wouldn’t have happened. So, it gives you—it’s a reminder of just how vital every election is, when it comes to these big landmark bills. AMY GOODMAN: And speaking of Planned Parenthood, the Senate parliamentarian ruling that Planned Parenthood could not be defunded for a year with just a majority vote, and then the Senate majority leader saying that he might overrule what she said. JOSHUA GREEN: Exactly. I mean, this is another steamrolling of congressional and constitutional norms, and we’ve seen this a lot over the last six months. And it tends to be attributed mainly to President Trump, because he is so offensive and transgressive and kind of crashes through these norms. But the real story here, it seems to me, is that mainstream Republicans, like Mitch McConnell, are doing the same thing and going even further, having no open hearings on this landmark bill, not following the normal rules of procedure. And now, when you have a Senate parliamentarian saying, “No, what you’re trying to do is against the rules,” they’re saying, “All right, well, we’re just going to erase the rules and go ahead and do it anyway.” There’s something really dangerous about that. NEXTIs Trump’s Base Turning on the President over His Humiliation of Attorney General Jeff Sessions?